A rhizome (root) of a plant native to Asia, ginger, aka Zingiber officinale, is also a popular remedy for digestive distress and nausea relief. Recent medical research has focused on ginger’s potential to reduce osteoarthritis pain and to lower cholesterol and improve blood-sugar levels. Look for unblemished, firm and unwrinkled ginger root in the produce section. Fresh ginger will keep for about one week refrigerated. Or peel, slice into ¼-inch rounds and freeze for later. Whole fresh ginger works well for smoothies, soups, stews and stir-fries. Creative use: Warming or iced tea. Peel and slice two to three ¼-inch rounds into a mug. Pour boiling water over the slices and let steep for 5 minutes. 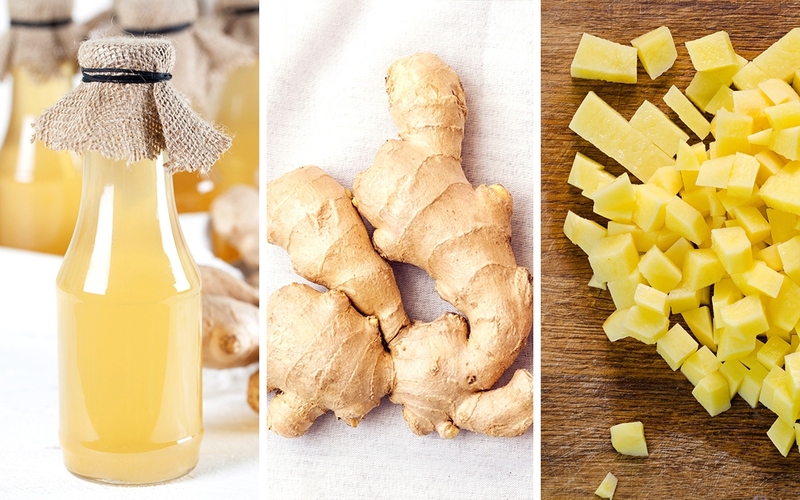 Remove ginger slices, add ½ to 1 teaspoon honey, and finish with a squeeze of lemon (for extra vitamin C). Pour over ice or refrigerate if a cool sip is desired. Available in the Asian cooking section of natural markets. Fantastic if you dread peeling and chopping whole fresh ginger or are a time-strapped home cook. If a recipe doesn’t specifically call for fresh ginger (which remains in large chunks), this is a good option. Also available in the Asian cooking section of natural markets. Ginger juice can be added to marinades, stir-fries, soups—or even cocktails. Creative use: Nonalcoholic spritzer. Add 1 teaspoon ginger juice and 1 tablespoon of agave to 1 cup sparkling water or tonic water. If you prefer sweet, add more agave. For a festive look, garnish with candied ginger.